There’s a certain roster of magazines that aren’t entitled Vogue, Harper’s Bazaar or ELLE that regularly take our fancy. Glass magazine is certainly one of them and since the publication invited a favorite model of ours onto its latest issue, it naturally caught the attention of forum members. 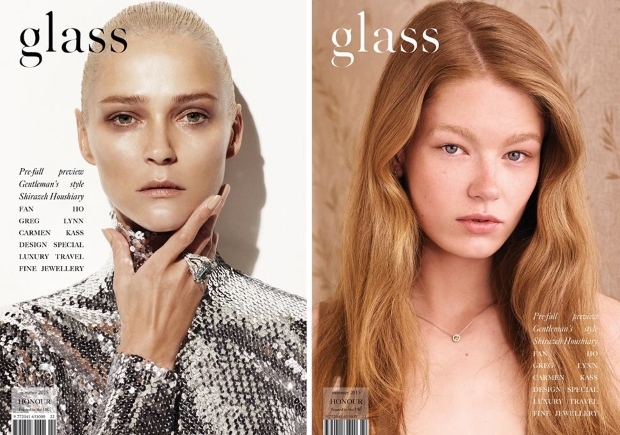 Carmen Kass graces one of Glass‘ Summer 2015 covers, while Hollie-May Saker features on the title’s second offering. Both are distinctively different: Carmen looks captivating in a show-stopping Christian Dior top as she dominates the shot, while Hollie-May lets her natural beauty do the talking on the other. It was therefore only natural that one cover was going to stand out from the other. “Carmen’s cover is beautiful! Looking forward to the edits!” raved justaguy right away, about to be mimicked by the rest of the thread. “Carmen’s cover without a doubt. It’s an almost iconic and memorable shot,” favored Benn98, showing great enthusiasm. Also elated was khyrk, who enthused, “Carmen! Great to see her!” This sure sounds good for sales this month. “Carmen!! Love seeing her get more work! Excited to see the editorial,” shared an optimistic happycanadian. “Love Carmen’s cover so much. Looking forward to the contents,” mistress_f anticipated. “I like both covers and they usually produce really good editorials, so I’m excited,” KateTheGreatest praised. Poor Hollie-May doesn’t get a look when Carmen’s on the scene. Which do you prefer? Drop us a comment here.